Can they survive in the age of globalization? The American labor movement suffered a major blow at its 50th-anniversary convention in Chicago in July. 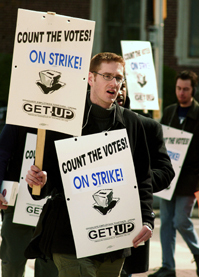 The beleaguered AFL-CIO split nearly in half as seven unions formed the rival Change to Win coalition. The seceding unions argued that the AFL-CIO, led by John Sweeney, had been spending too much time and money trying to get Democrats elected to national office and not enough time recruiting new members. The defections reflect the concern over declining union membership in recent years, due in part to automation and job outsourcing. Some 3 million U.S. factory jobs alone were lost between 2000 and 2003. As he starts a new term, Sweeney confronts the possibility of more defections, businesses that are aggressively anti-union and unafraid to move operations abroad and a younger generation that knows little about unions. The split also raises questions for the Democrats, who historically derived funding and votes from the labor movement.